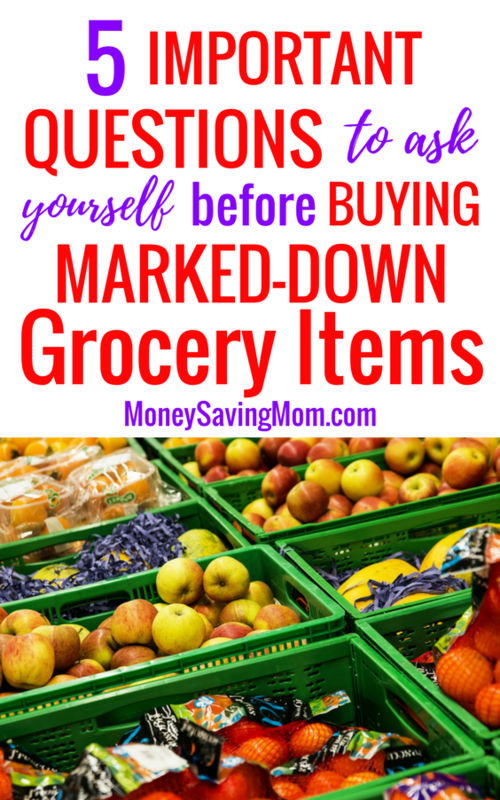 As I’ve posted about buying markdowns at the grocery store recently, a lot of people have asked me questions on buying markdowns and how to know if a clearance item is still good and worth buying. 1. What is the Sell By date? Look at the Sell By Date. Is this item good for a few more days? Will we be able to use it up by the Sell By Date? If you can’t use it up by the Sell By Date, is it something you can freeze? You can freeze so many different things — like most fruit and veggies, bread, milk, meat, cheese, cottage cheese, butter, and so much more. Here’s a great list of 31 Things You Can Freeze. 2. Does it still look fresh? Check to make sure that it still looks fresh. Are there dents or holes in the can or package? Do you see any mold or spots going bad? If it’s fruit or veggies, if the price is really great, you might be okay with buying those bananas with black spots on them or those sweet potatoes growing eyes because you’re going to freeze the bananas to use in smoothies or just cut off the eyes. For other things, like bread or cheese, you definitely don’t want to buy it if there’s mold on it! One of my Facebook Live viewers told me that she bought some garlic bread that was in a foil package marked down to a great price only to discover that it was moldy inside. Yuck! 3. Is this something my family will eat? This might seem like a no-brainer question to ask, but I think sometimes it’s easy to get so caught up in something being a “great deal” that we forget that it might not be something our family would even eat! So be sure to stop and ask if at least a few people in your family will eat the item before you just get all excited about a cheap, cheap price on something no one in your family will touch with a ten-foot pole! 4. How much will they eat before the Sell By date? If your family will eat it, how much will they eat before the item goes bad? Be realistic here! For instance, when I found the eggs marked down to $1.49 per dozen recently, I wanted to buy all 20 dozen that were marked down. But I knew that was being unrealistic because the Sell By date was in less than a week. Instead, I thought through what we could make over the next week, what we could make and freeze, and what was realistic. I ended up buying 7 dozen and we had no trouble going through that many. Tip: One thing to keep in mind is that Sell By dates are just that — when a store needs to sell an item by. They aren’t necessarily Eat By dates. 🙂 Items will still often be good to eat a few days or even weeks after the Sell By date. 5. Do I have room in my budget? Do yourself a favor and make sure you convince yourself that something is worth buying, still good, your family will eat it, and you know how much your family will eat first. Then, if you haven’t already talked yourself out of the purchase, you can determine if there’s room in the budget for it. Note: You may have some room in the budget, but not enough room to buy multiples. Don’t stress over the fact that you don’t have enough room in your budget to buy as many as you wish you could, just be excited that you were able to buy some! Do you ever question if you should leave some of the marked down food for others to get too? My family can afford to buy food, but I know there are some families who really struggle financially. Particularly with dairy, meat, and produce items I wonder if I should leave them. I usually buy one item but think I should leave the rest for others who may need the good deal more than me. What are your thoughts on this issue? Does anyone else struggle with this? YES! All. the. time. However, I rarely see people buy the marked down stuff at our Krogers. Sadly. 🙁 I’d rather buy it than have it be thrown out. But if I find a great deal and I know other people who could use it, too, I’ll buy extras for them or will be sure to let them know so they can go get in on the good deal, too. I always try to think about who else could benefit from any good deal I find. I’ve struggled with this also. Try to remember just because you “can” afford it doesn’t mean God might not be using it as a way to bless you! I can afford new clothes for my kids, but I accept hand me downs with the idea, this is a blessing from God and now I can pay it “forward”:) I’m sure someone else could use the hand me downs more than us, just like there is always someone who could benefit more by the markdowns. However, consider your “blessing”. I love your last question. I always try to remind myself that a good deal doesn’t really matter if I don’t have the cash for it. 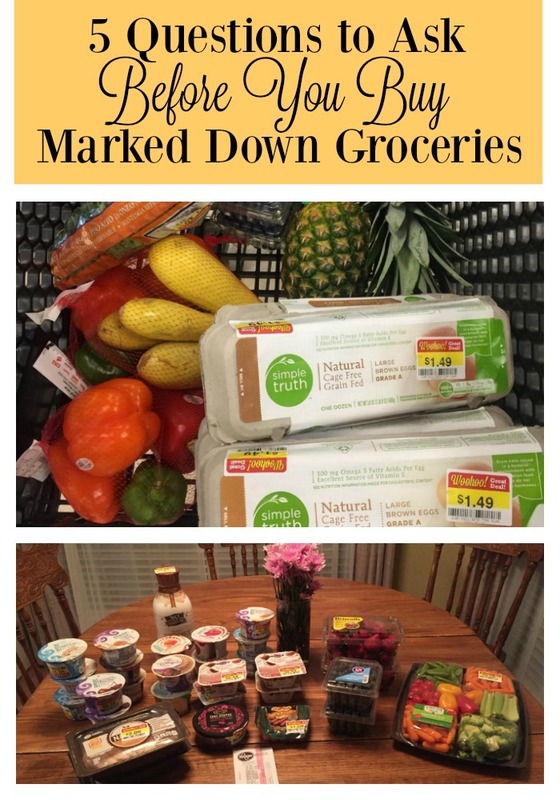 We have a super tight grocery budget, and I stock up on good deals when I can, but if I’m out of money, I’m out of money and we’ll be ok without that item. I always try to remind myself that a good deal doesn’t really matter if I don’t have the cash for it. <--- YES! You don’t need to worry so much about eggs. In Europe they don’t even refrigerate them. I read alot about their safety when I had some in a fridge that broke and they got warm. We ate them with no issue, since we cook them anyway. And I also read some stores just take “expired” ones and put them into new cartons with new dates. While other countries don’t refrigerate eggs, it is because they are handled differently. In America, eggs are washed and the protective coating that allows them to stay un-refrigerated is removed. At least 90% of the food in my freezer was discounted and I froze just before the sell by date. Have only had an issue once with chicken that I bought discounted and cooked a day before the sell by date that was bad. 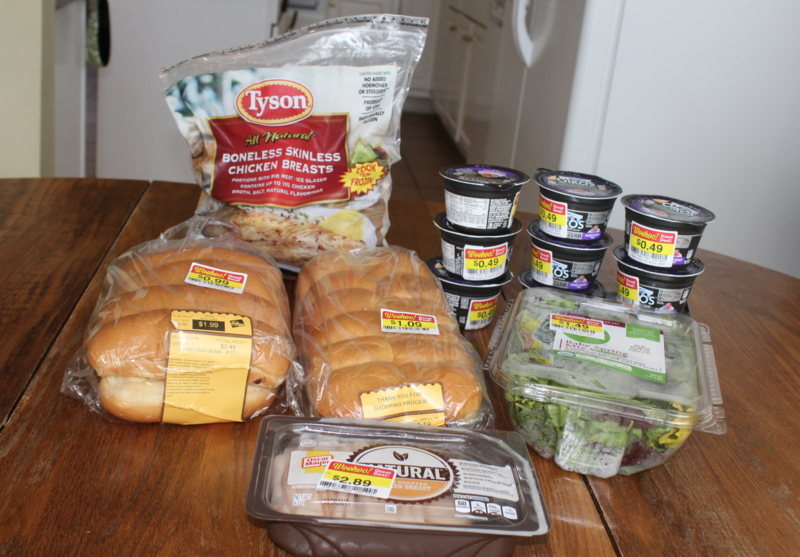 I love buying clearance items at my Kroger! I find the website stilltasty.com to be helpful in determining how long various foods are good. I have used some of the great markdown finds to bake extras for friends. Everyone likes a fresh baked treat while not breaking the bank with ingredient costs. I’m always super wary of discounted meat because my mom said, when she worked at a Kroger affiliate, sometimes meat would be left out of the cooler as they were rearranging and not get put back in a timely fashion. They would discount this meat as a result. I didn’t believe her until i bought a beef brisket that looked good, but when we opened it, we could tell it was long gone. In Lincoln, NE food like you describe is primarily donated to FoodNet and given away free of charge to anyone of any income. In case anyone wants to start a similar ministry or see if something similar exists in the area they live, here’s the link.